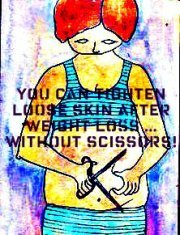 Loose Skin After Weight Loss - Here Are Some Simple Tips To Help Tighten Loose Skin After Weight Loss: WITHOUT Scissors! "How can I tighten loose skin after weight loss?" That is, by far, one of the most popular questions I receive from website visitors. AND I CAN RELATE: When I lost some 70 pounds in a 60-day water fast some years ago, I was delighted to be slimmer. BUT, I was horrified by the large slabs of sagging meat that covered my upper body, mid-section and thighs. I often looked at myself in the mirror and got the urge to do like the person in the drawing above. I WANTED TO CUT IT OFF! Thank goodness, over a period of one year, I was able to tighten the loose skin and - even better - I did not have to use scissors or resort to cosmetic surgery. Now, please ... I am NOT here to shoot down so called Body Lift or Abdominoplasty procedures. In some Extreme Cases, the loose skin after weight loss is so great that invasive surgery becomes a proper choice. Loose skin can cause irritations as the sagging flesh rubs on other parts of the body, and as folded layers of skin collect heat, dirt, sweat and toxins, not to mention the body's own weight.The result, in some cases, can be serious rashes, infections and other painful skin lessions such as Bed Sores, which are also referred to as "pressure ulcers". Indeed, loose skin after weight loss can be very precarious and even dangerous. So, to be clear: I definitely do not intend to write an "all-encompassing" essay on the skin. I am NOT a dermatologist. Certainly there are many doctors and skin specialists who can offter you more specific solutions than the ones I write about here. But, notwhitstanding, I AM a person who dealt with and was overcame loose skin after weight loss. 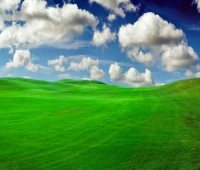 In this page, my aim is to share with you WHAT HELPED ME, in hopes that perhaps it can help you too. I recall going to see Aldo, the owner of the neighborhood gym where I worked-out regularly. I showed him my layers of loose skin and BEGGED him to give me a solution. He was a very caring yet stern. Aldo believed in hard work and dedication - NOT overnight cures or shortcuts. So, he just looked at me from head to toe for a moment and said: What is your body fat percentage?" "My what?" I asked. "Well you definitely have a lot of loose skin there, but I think your real problem is body fat", he added. I was puzzled and annoyed. After all, I had just fasted for SIXTY days! What do you mean I have body fat? Are you nuts? Grrrrr...! Well, in spite of my irrtation, I followed Aldo's advise and measured my body fat percentage, which ended up being an excessive 24%. According to various online body-mass calculator tools, the IDEAL figure for men is 14% to 17%. LEAN, which was my goal, is 6% to 13% body fat. For women, the IDEAL is 21% to 24% and LEAN is 14% to 20%. How is body fat measured? There are various ways to achieve this including Dexa Scanners, Water Weighing, the so-called "Bod-Pod" and the old-fashioned Body Calipers. You can read more about these methods Here. You can also use this online body calculator to get an idea of where you stand. I had to realize that, even though I had fasted and lost more than 70 pounds, I STILL was carrying around way too much fat. Aldo smiled and simply said: "Keep working out and getting lean ... the loose skin will take care of itself in the measure that you burn more body fat". I was not wild about the results. But, like it or not, I could not deny that he was right. Over the months I started doing light weight-training and 30 minutes of cardio three times a week, COMBINED WITH A LOW-FAT DIET. This free high-power fat loss program is excellent and can definitely help you. Since at this point you will not be fasting, I encourage you to BE PATIENT AND THOROUGH. For me, getting rid of loose skin after weight loss did not happen overnight. It actually took me the better part of 11 months of consistent work to get it done. But the sagging skin all but disappeared. I was amazed to see how my skin tightened up by just losing more fat. Am I "ripped"? NO. I am a pretty regular guy with a very average build. But I DID, at the time, go from 24% body fat to the ideal 14%. That was enough for me. So... one of the ways that I was able to tighten loose skin after weight loss was to lower my body-fat percentages through cardio, weight-training and a low-fat diet. Unless you are an extreme case, there is no reason for you to even consider any type of surgery before you follow this plan for at least six months. And even if you ARE an extreme case, this system can help you to minimize the amount of loose skin you may need to have surgically removed. Men should not expect to look sleek and ripped unless they have single-digit body fat, and women in the low teens. It is very rare to see someone with loose skin after weight loss who has a low body-fat percentage. Give this step a wholehearted shot and you'll be amazed at the result. But there is more you can do. There are also some simple skin products that you can use to help tighten loose skin after weight loss. The links I have included will take you to listings on Amazon.com so that you can see what I am talking about. The products I mention can be found in most health-food stores and even in some supermarkets. They are inexpensive but can be highly beneficial when used together to help tighten loose skin after weight loss. The first thing that helped me was to start using Loofah Exfoliating Soap Loofah is a very powerful skin exfoliator. It digs deep into the pores to cleanse dirt, grime, dead cells and other toxins. It helps to keep the pores open for better absorption of the other two skin lotions described below. When you have loose skin after weight loss, keeping it clean is an asbolute must. I suggest you bathe at least twice daily and make sure to scrub the skin generously. Loofah will keep the skin clean and prevent the development of rashes, infections or other types of sores. You can visit Loofah Soap Variations when you have a chance to learn more. Once you have bathed and scrubbed your skin with Loofah, then it is time to massage a good amount of Organic Cocoa Butter into the skin. Make sure to cover each of the areas of loose skin until they are fully saturated. Pregnant women have long used cocoa butter to prevent and treat stretch marks. But it also is very useful in helping to keep the skin moist and elastic. Cocoa butter is often recommended to treat skin conditions such as dermatitis and eczema. Why? Because it creates a barrier between the skin and the environment, thus helping the former retain moisture. Morever, when you arise in the morning and before you retire at night, rub in some Pure Shea Butter, another terrific skin moisturizer and healter. Shea butter has been used to help heal burns, sores, scars, dermatitis, psoriasis, dandruff, and stretch marks. It may also help diminish wrinkles by moisturizing the skin, promoting cell renewal, and increasing circulation. Shea butter contains cinnamic acid, a substance that helps protect the skin from harmful UV rays. There are a few inexpensive additional supplements that you can try to help you tighten loose skin after weight loss. Aloe Vera Gel, Soy Protein and so-called Canadian Preparation H are others some have used to improve the skin's elasticity. 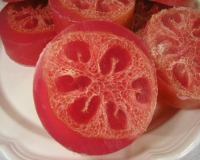 Increasing the daily consumption of raw foods such as olives, tomatoes, olives and coconuts are considered to help the body's production of Elastin and Collagen. Hyaluronic Acid is found naturally in bodily tissues and is a common ingredient used in skin-care products. It is constantly being used-up by the body, so supplementing your diet with 50mg per day can be good for the skin. Hyaluronic Acid is very important to sustain muscle growth. If you decide to follow the fat-loss tip I gave you above, then this supplement can be especially useful. To learn more about Hyaluronic acid, go Here. Furthermore, Vitamins A, C, E and zinc, and MSM Powder are still more supplements that can help tighten loose skin after weight loss. While all of these tips I have given you can help, nobody can give you full assurance that ALL of your skin will tighten. But regular exercise, nutrition and overall healthy-living - without a doubt - can stack the deck in your favor. If you find that MOST of the loose skin after weight loss has tightened, then you will have to decide if that is something you are willing to accept. My suggestion is: GIVE IT TIME. 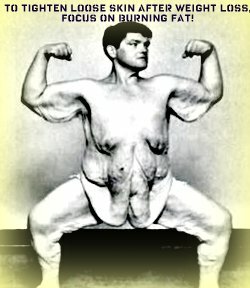 Continue to focus on losing fat and chances are good that the loose skin after weight loss will tighten. I have seen various cases where skin tightened almost completely after one-to-two years via sustained cardio, weight training and a low-fat diet. If, however, you're evaluating the possibility of skin-removal surgery, I implore you to PLEASE go to your doctor and ask him or her for input. Skin removal is a MAJOR surgery with a very painful and long recovery process. You don't want to follow through with this procedure (and pay for a plastic surgeon's European vacation) without being TOTALLY sure that surgery is necessary. Any type of invasive surgery should ALWAYS be done ONLY as a very last resort. Return from Loose Skin After Weight Loss to HOME.